It was time to leave our sunny pocket universe tucked away inside rainy Norway. I checked the forecast and the minute we leave Storfjord, we're going to get dumped on. Outside of this place, I think we've had maybe two days of good weather the entire two weeks we've been here. Typical RideDOT.com. Suiting up for another rainy ride. 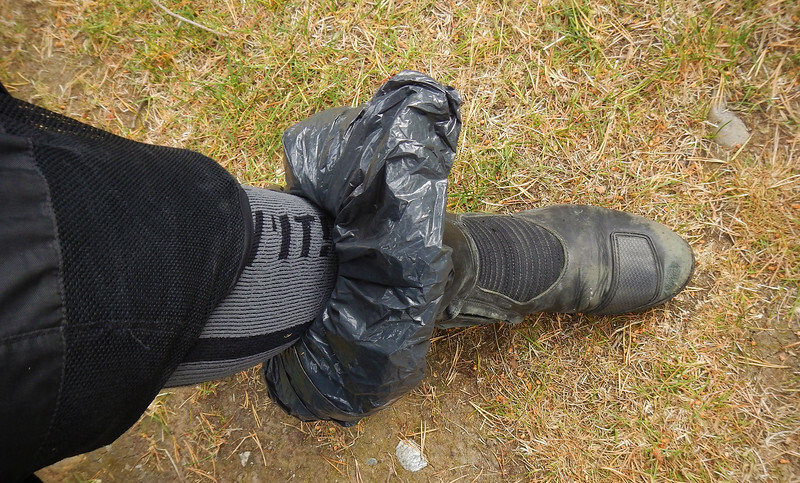 Going through a lot of plastic bags to keep my feet dry. Today is exciting though. 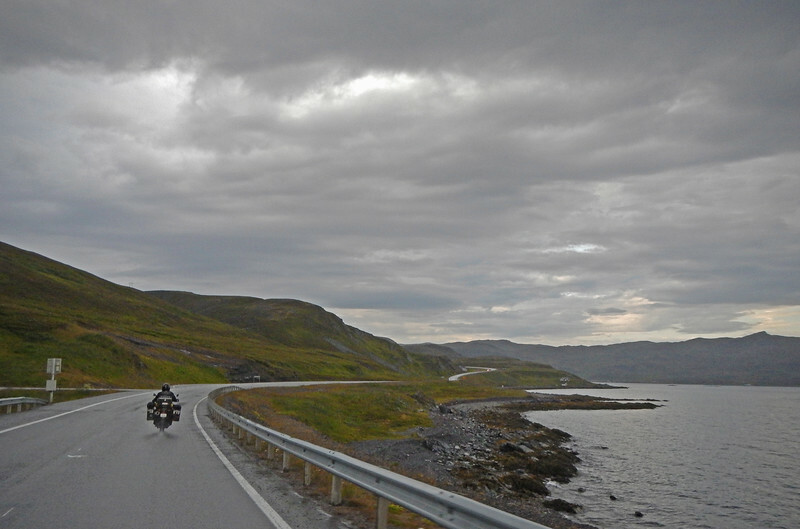 We're on our way to Nordkapp (North Cape in English). It's the northern-most point in Europe, marking our last days in Norway and the mid-point of our journey through Scandinavia. 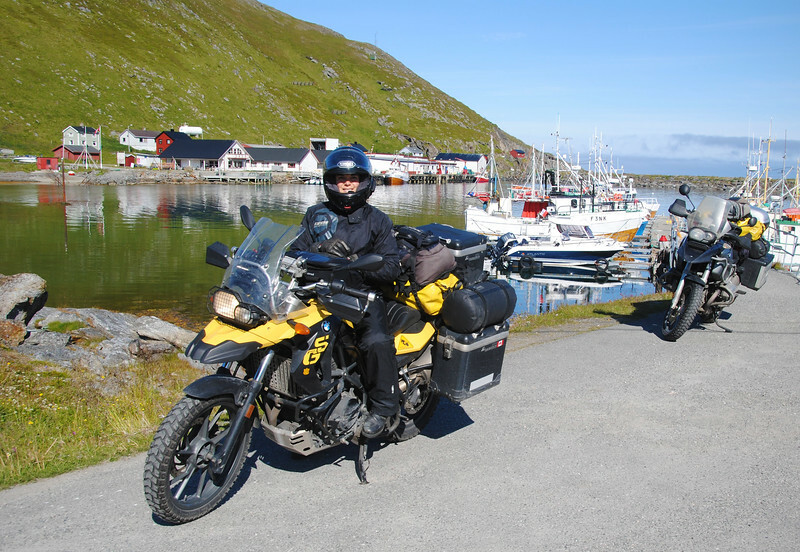 Nordkapp, like Deadhorse and Ushuaia is kind of a bucketlist item for overland travelers. 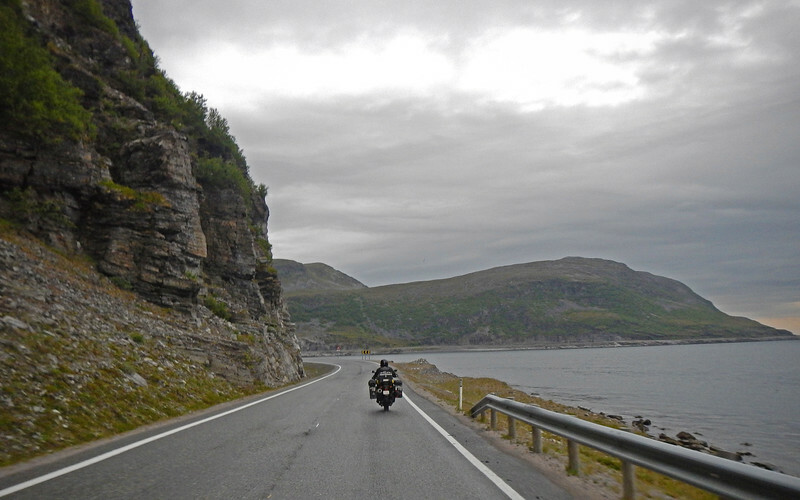 The coastal road takes us through some undramatic scenery compared to the Lofoten Islands. All there seems to be this far north are road, rocks and water. 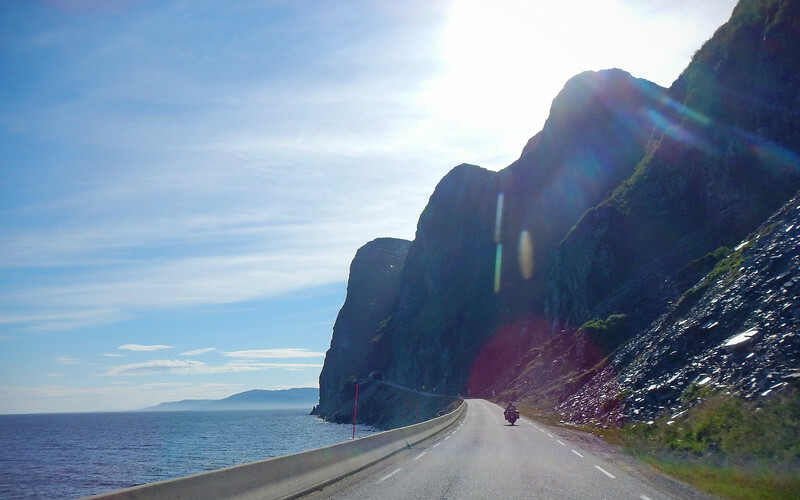 We see these drying racks everywhere while riding along the coast in Norway. The fish is dried in the cold spring air, the temperature just warm enough to avoid freezing the fish but cold enough to ward off bacteria and insects. 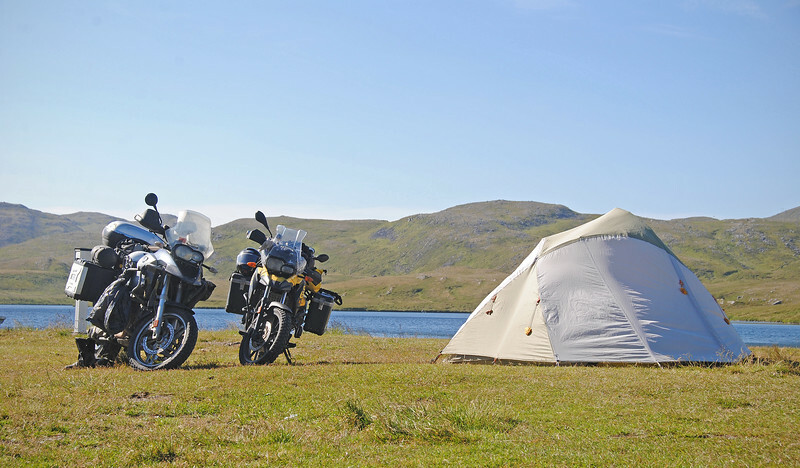 Looks like it would make for a quick tent. 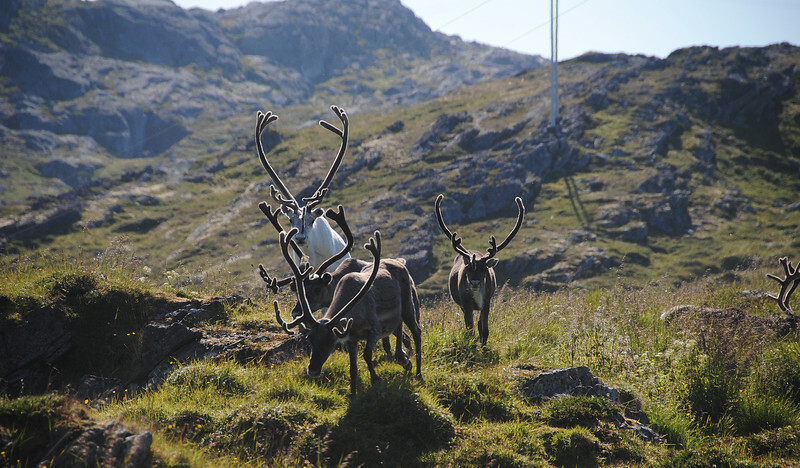 We see tons of reindeer along the side of the road. This is moulting season, so their fur is falling off. 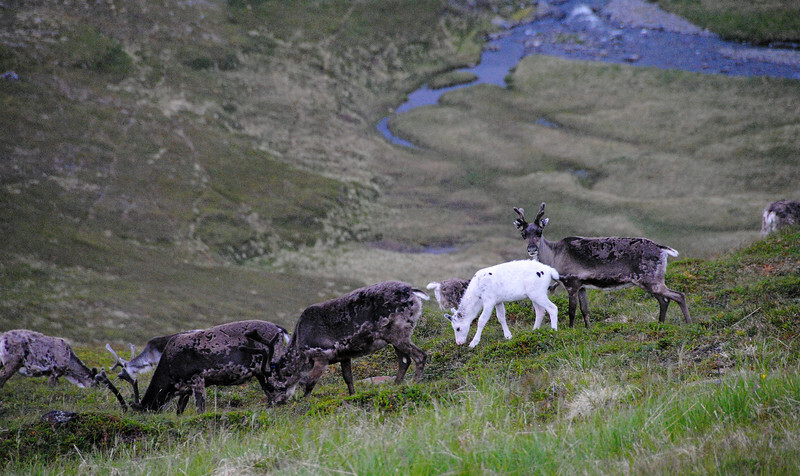 I think this is the first time that we've seen reindeer in the wild! Very cool! 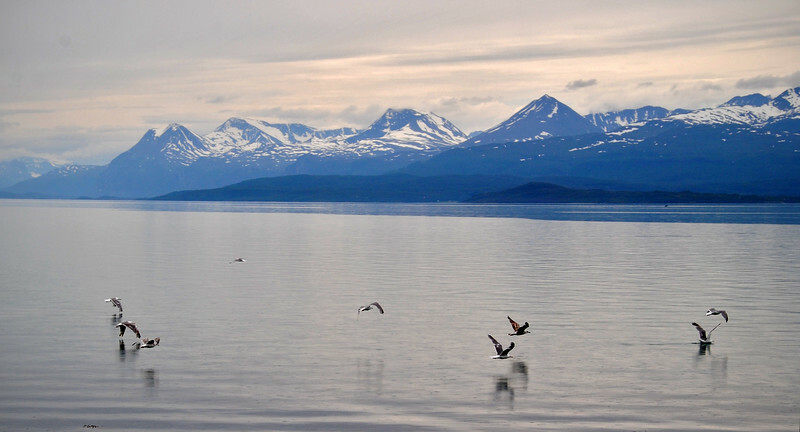 There are about 200,000 of them in Northern Norway. They're raised by the indigenous Sami people who used them for their meat, pelts and antlers, and to sell them to jolly, fat men in red suits. 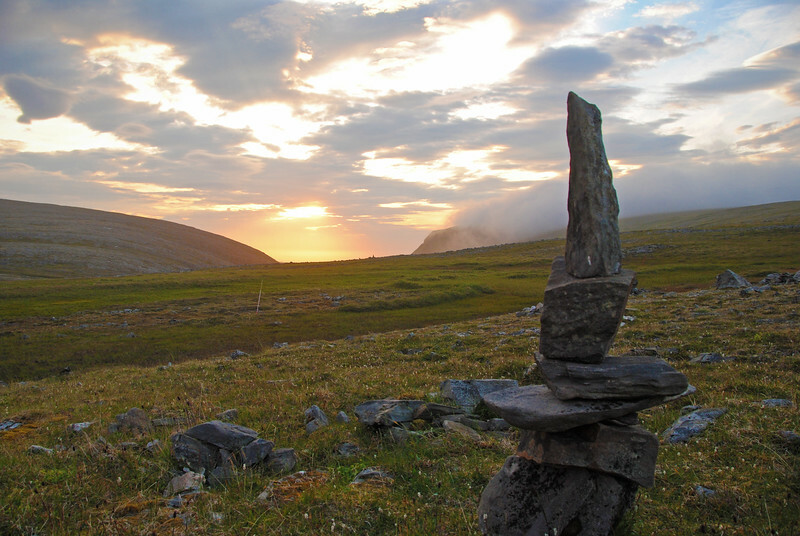 Although the inukshuk is a Canadian Inuit symbol, the teepee isn't. We've seen lots of teepees and related pictures and signs while traveling through the north and at first, I thought it was just North American kitsch that the Norwegians were borrowing. 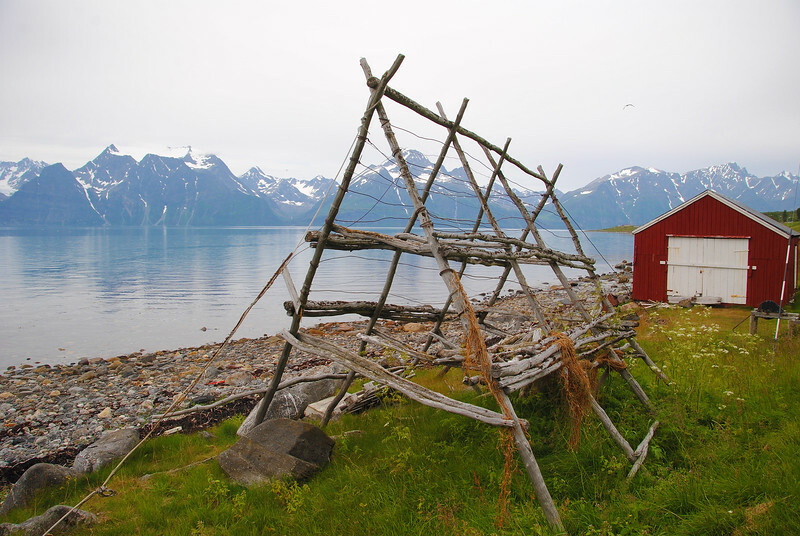 But actually, the native Sami people live in similar cone-shaped huts called lavvu. 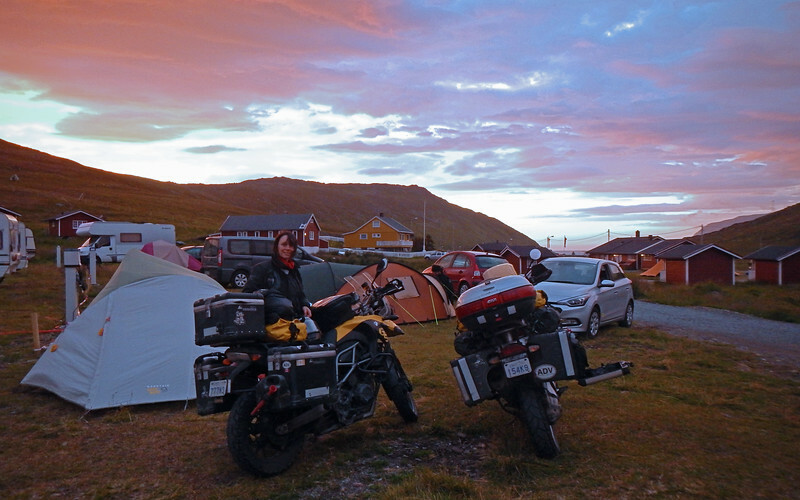 Nordkapp is basically just a very expensive parking lot. It's $30USD per person just to enter the premises, which consists of a huge parking lot and a visitors centre. We sat through the panoramic movie screening which was interesting, but the diorama displays inside the centre were poor and embarrassing. 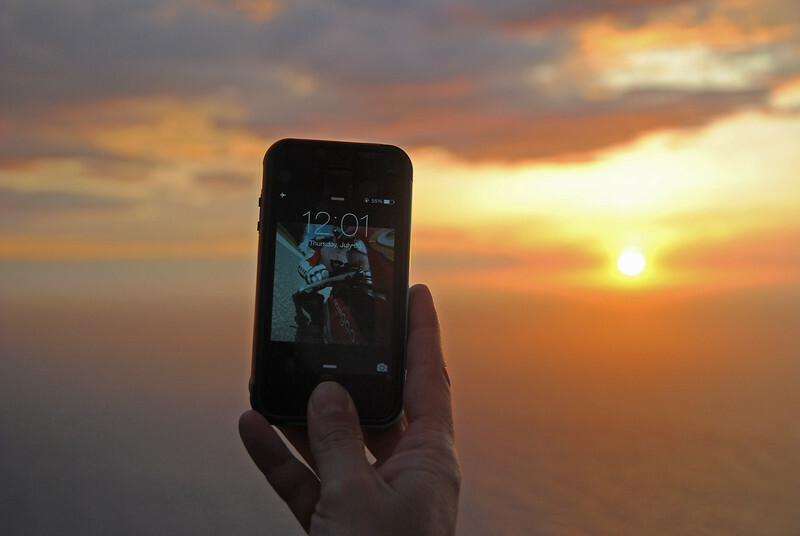 Most people just come to see the sunset. It's so cold and windy up here. We had to put on all our layers and we alternated from hanging around the monument and then ducking inside the vistor centre to warm up. I think it's so windy because of the lack of any mountains at the very north coast. This is the second time we've ridden to the very northern reaches of a continent. The last time was when we trekked up the Dalton Road to Deadhorse, Alaska. What a different ride that was through the muck and mud. 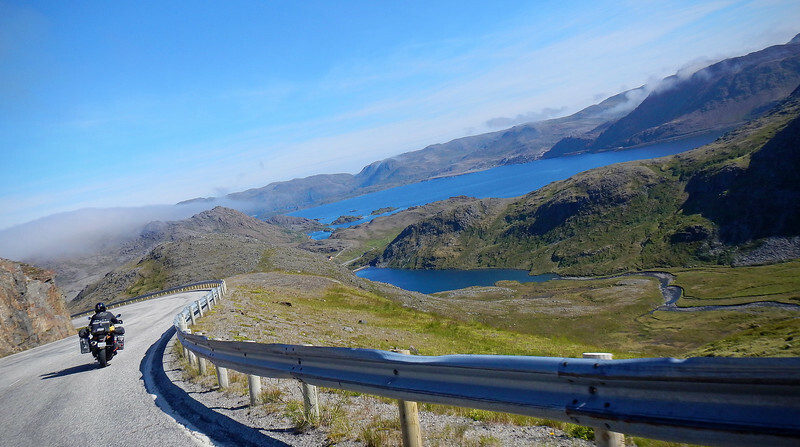 Norway's road to the Arctic Ocean is pretty much paved all the way, but it is still quite a long journey to travel from the rest of Europe. 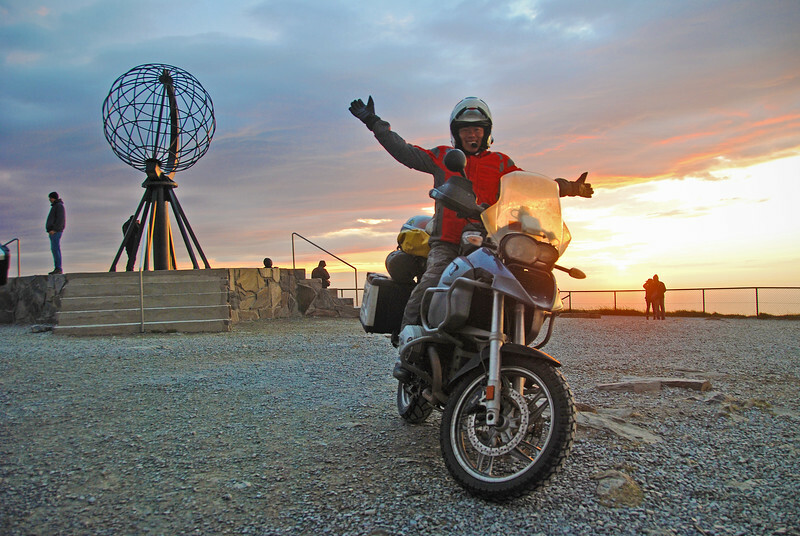 The distance from Copenhagen (the gateway to Scandinavia) and Nordkapp is 2,400 kms! That's almost half-way across Canada. 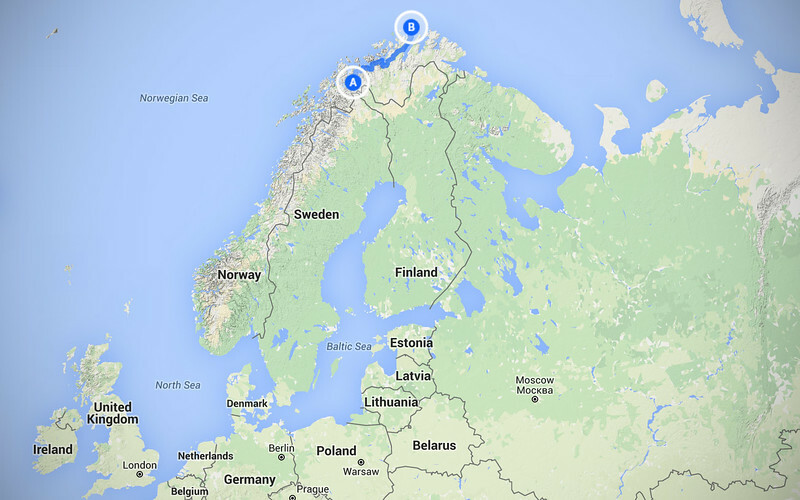 Nordkapp is actually further north than Deadhorse, Alaska. Just over 100 kms closer to the North Pole. 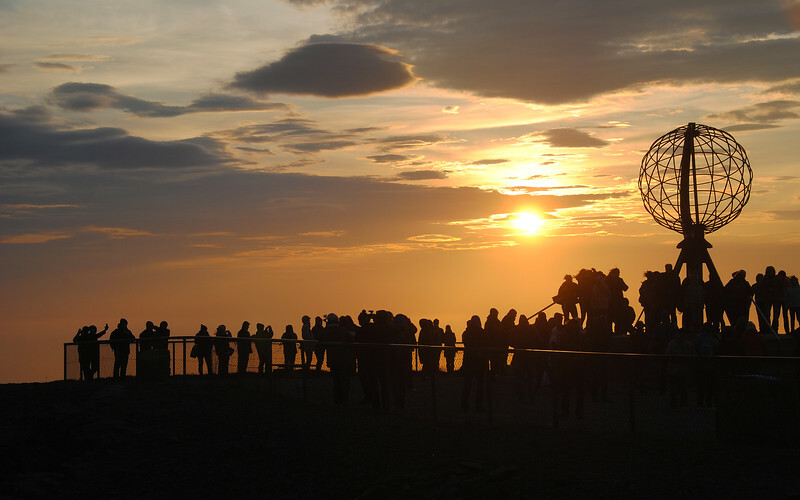 Nordkapp is a popular tourist destination because a lot of people want to say they've traveled as far north as they could in continental Europe. 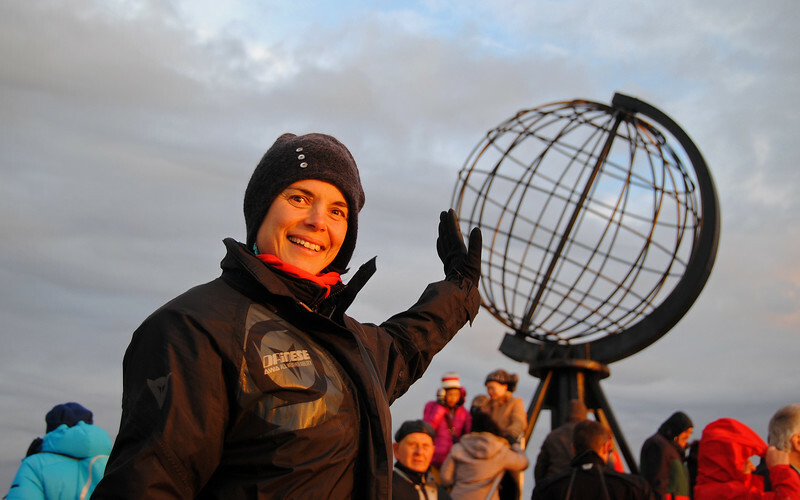 But also, this spot is where you can catch the last Polar Day (24 hours of daylight) on the continent. It just worked out that this was the actual last day in 2015! We totally did not plan that, but when we found out, we were very excited to see it! As you can tell, so were a lot of other people. Over an hour of waiting and loitering around, the moment is almost here! Neda waits with excited anticipation! It was a few minutes before midnight, and the sun was slowly sinking towards the horizon, turning the sky around it a deep shade of orange. But rather than disappearing from view and letting darkness slowly creep over the land, it halted its downward path right at the moment it touched the water and at the stroke of midnight, reversed direction to start climbing the sky again. Wow, that was cool! With the show over, we headed back to our campsite just a few kms away. There was a bit of traffic on the road back, because everyone else was leaving as if a concert or a baseball game just let out. This picture was taken around 1AM. This sun's been up for an hour already! Well, technically it never set, so really it's been up since May 14th... Isn't that crazy? 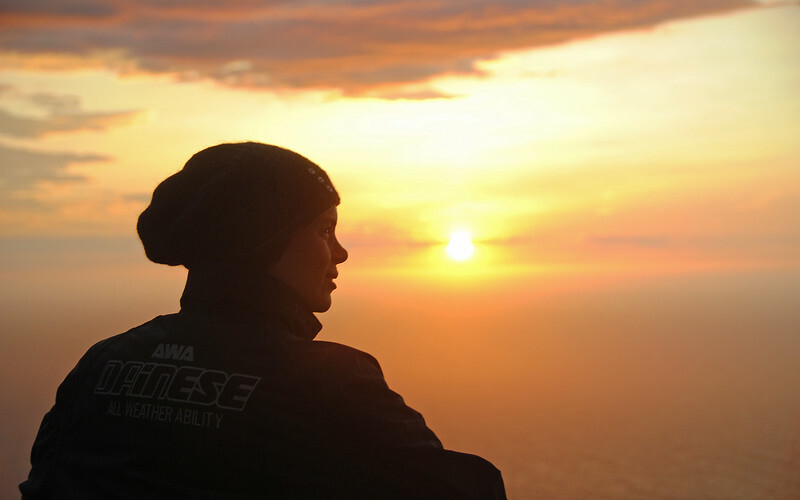 I'm so surprised that Neda is not only wide awake but practically wired at this time of day (night?). Normally she starts turning into a pumpkin around 10PM and is fully asleep by 11. It's amazing how attuned she is to the sun. Unlike me, my normal sleep time is consistently around 2-3AM regardless of the time of year or where the sun is. But the minute Neda puts on her eye mask she is fast asleep. So I work a little bit on another blog entry in the campsite's kitchen before turning in. We've been constantly on the move over the last few weeks that it's left me with little time to edit pictures and write, so the blog is falling very far behind! We wake up very late the next day and everyone's left. We're the only ones in the campsite! We're at no risk of running out of daylight up here, which suits us just fine because we like to dawdle in the mornings. However, this isn't going to last. Nowhere to go but south now and I'm not looking forward to the days getting shorter. At least it's finally sunny! Deserted cabins at our campsite. These were expensive to rent out. 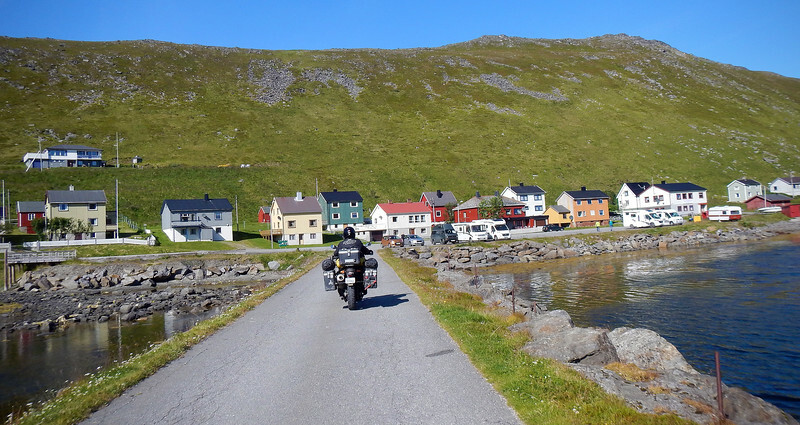 We rode into Skarsvag for a little bit to check out the town. 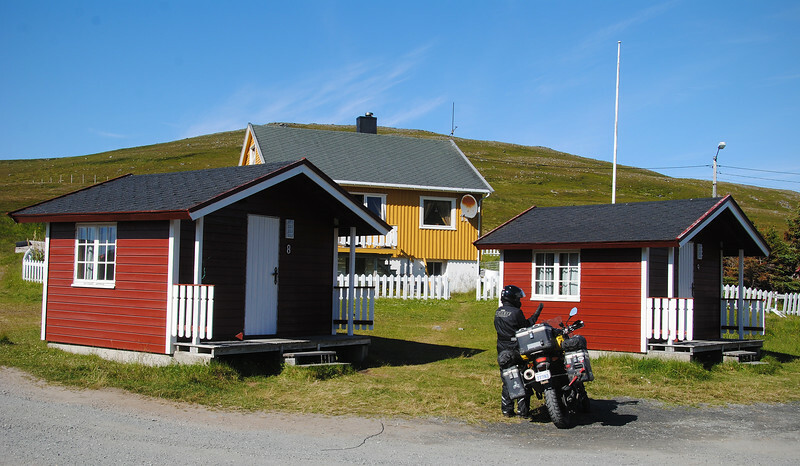 Typical fishing village, but it has the distinction of being the northern-most one! We got so close! And the antlers are so furry! Cute! 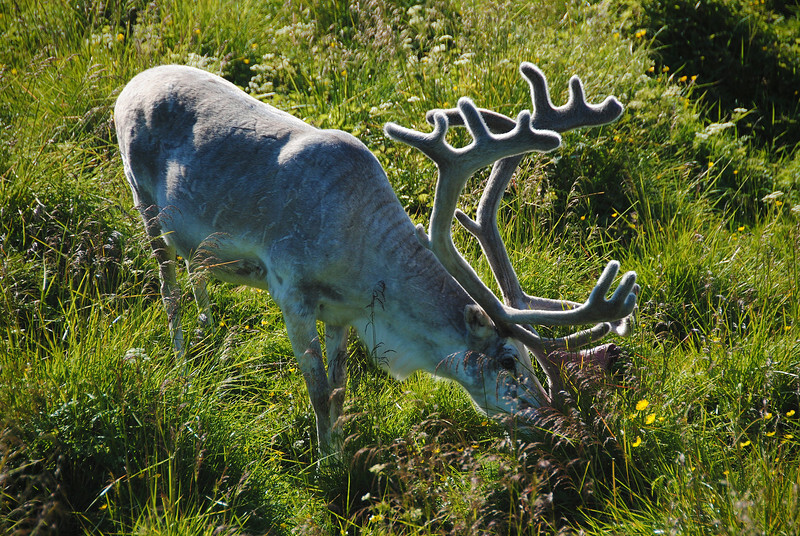 Did you know male reindeers shed their antlers as well as their fur during moulting season? Their antlers grow back for the winter and get bigger every year the older they are. You can tell these antlers are already in their growing phase because they're covered with fur called velvet, which feeds nutrients to the growing bone underneath. Once the antlers grow to full size, the velvet is no longer needed and falls off. They decide that we're not a threat and go back to eating to feed their growing antlers. Beautiful creatures! Heading south with the glorious sunshine above us! 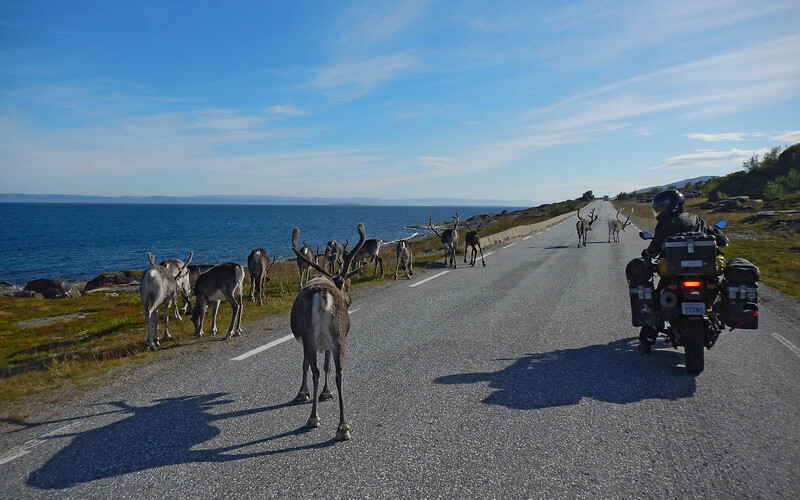 Lots of reindeer warning signs on the roads up here. 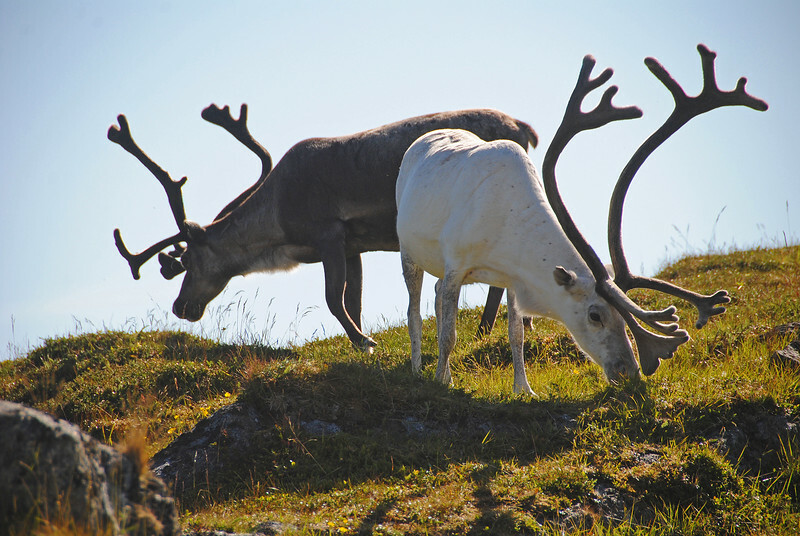 Every year, 4000 reindeer collisions are reported in Northern Norway. Reminds me of the moose problem they have on the island of Newfoundland.